On an autumn afternoon, two teams met and a single goal was scored. But not on a soccer field. 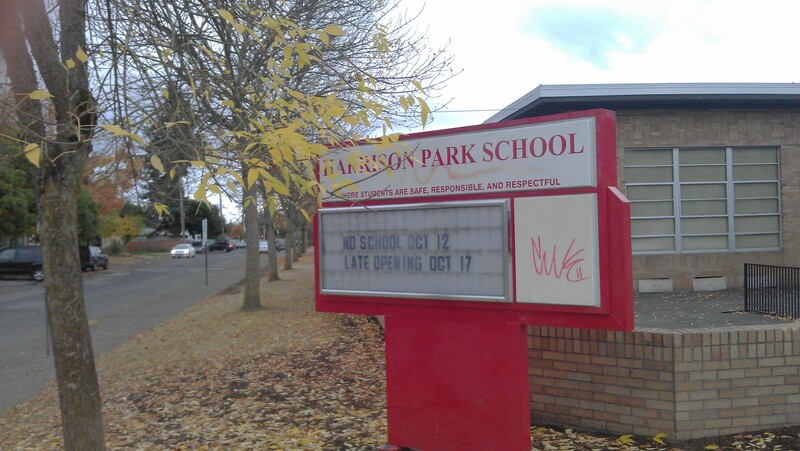 It was at Harrison Park School, in southeast Portland. The two teams on hand were Major League Soccer’s Portland Timbers and major league volunteers Hands On Portland. The goal wasn’t to win, but to paint. As part of the Timbers’ Stand Together Week, they teamed up with Hands On Portland to volunteer in 30 different places this past week around the Portland metro area. This was week’s final volunteer event at Harrison Park School. Representatives from both teams met, along with at least 25 volunteers, to repaint several hallways at the school. Some volunteers were teachers at the school who wanted to help give the walls a coat of fresh paint for their students on Monday morning. Some volunteers, like my friend Catherine from our Teamworks team last summer, her friend Isaac, and I were from Hands On. 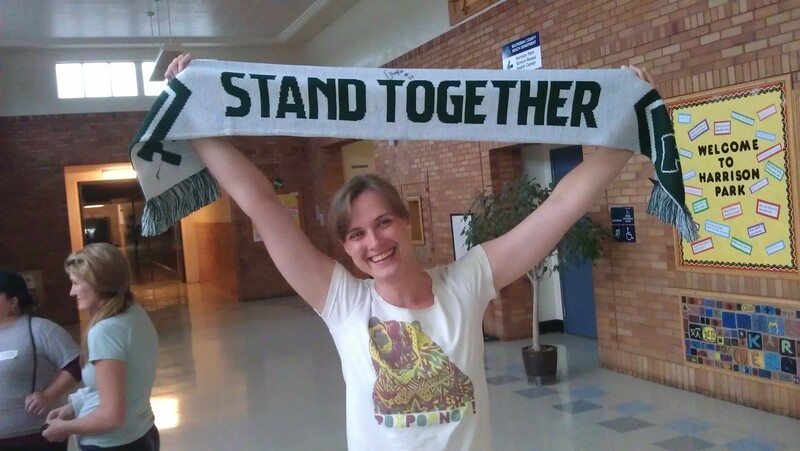 One volunteer was a Timbers’ season ticket holder and joined several of her co-workers for the event. There was a cameraman on hand to record the day. Even Diego Chara, a Portland Timbers star, was on hand to sign autographs and lend a hand with the painting. 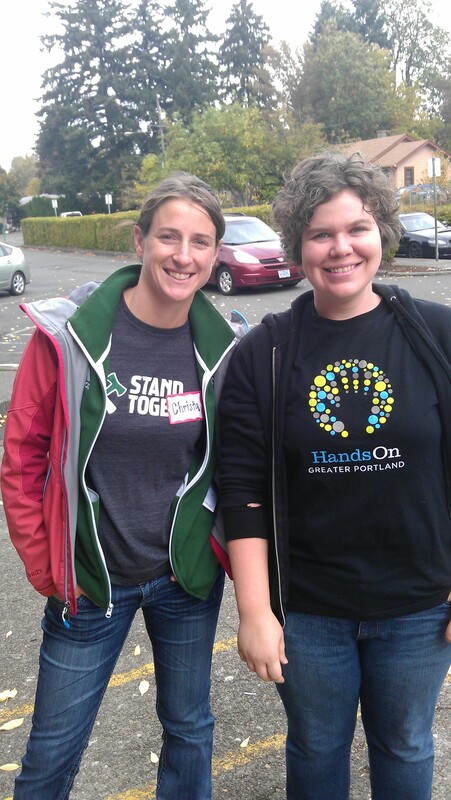 Christa (Timbers) and Lydia (Hands On). Before the event, I talked to Christa from the Timbers’ front office. I asked her why a professional soccer team with a rabid following wanted to spend a week doing volunteer work. She told me that even though the Timbers are a successful MLS franchise, there was more to being a part of the community than just selling tickets and filling a 20,000 person stadium. It’s about community, inspiring people to get involved, and making a difference. The painting started with a pep talk from Scott of the Timbers’ guest services (who, with dedication, slogged paint for the entire four-hour event). It also started with lots of donated paint, brushes, rollers, ladders, tarp, tape, and gusto. Our group was boisterous and talkative. Like so many volunteer efforts, it took organization not only from the outside groups, but from the hosts as well. Ralph, a self-described full-time volunteer at Harrison Park, had the direction and vision for the project. He also had several shopping carts (yes, we pushed shopping carts around a school), loaded with supplies. Sarah, Alycia, and several other teachers were on hand to help it get done. 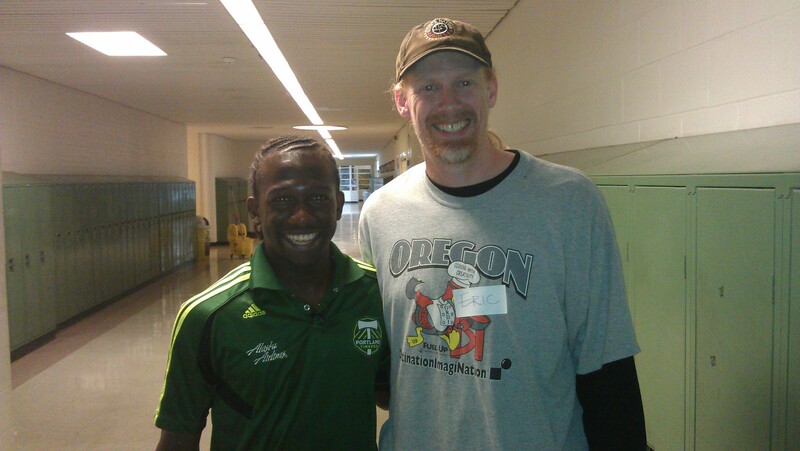 with Diego Chara, star of the Portland Timbers. After nearly four hours of taping, painting, and cleaning our boisterousness was long gone and we dragged ourselves out of the school. We were tired. But we had paint on our hands, smiles on our faces, and new colors on the walls. As tired as we were, one might wonder if it was worth the time just to slap some paint on the walls of a K-8 school in Portland. A coat of paint wouldn’t seem to make much of a difference. However, one of the teachers told me that kids are often affected by small changes. Every time there’s a difference, big or small, they notice. Their mood, attitude, and behavior changes. She felt quite certain that changing the colors of these hallways would have a greater effect on the children than we adults may realize. It also seems to me that every chance we get to give time to the little things; every occasion that we invest ourselves in the community; every moment we spend putting some elbow grease into our children’s schools; every day when disparate groups come together to work for the common good – it’s worth it. My friend Cathrine. Today we all stood together. Monday morning when hundreds of children pour down those repainted hallways, they’ll notice the new yellows and blues. They’ll talk to their friend, ask their teachers, and tell their parents about the new walls at the school. Then maybe, just maybe, those kids, their parents, and a few volunteers will know that on a nondescript fall afternoon, two teams met and a single goal was scored. Yesterday’s gift of time … Helped score a goal with a brush and a can of paint. The kids were the real winners. … Thanks to the Timbers, HandsOn, the volunteers and staff at Harrison Park School, and my Teamworks teammate Catherine, for opening the door on this opportunity. This entry was posted in In the community and tagged give time, Hands On, Hands On Greater Portland, Hands On Portland, Harrison Park School, investment, Major League Soccer, Portland Timbers, soccer. Bookmark the permalink. Yay! … Also, here’s a video from the Timber’s site on Day 7 of their campaign. Harrison park is at the end. Good Morning Eric, i just share some of your writing! Have a happy day!